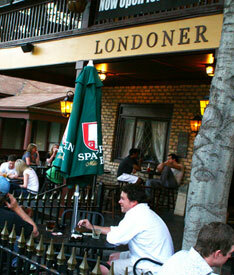 The Londoner is so cool that it has locations in Uptown, Addison, and Frisco. The Frisco pub boasts 26 beers on tap, a crazy long list of whiskeys and scotches, and a sports fan base worth bragging about. We love the wood-laden interior—which gives this tiny, dim-lit pub a cozy feel–and the classic English fare. (The shepherd’s pie makes a regular appearance in our dreams.) If you’re in the mood for some activity other than beer tipping, challenge your blokes to a game of darts or catch a football—er, soccer—game on one of the flat-screen TVs. (The pub airs all English Premier Soccer games when available.) Tip: the jukebox is free, but they don’t tell you until after you put money in. We learned the hard way.